Earlier this year I met up with Kristy Scrymgeour, the owner and manager of the women’s European pro cycling team Specialized lululemon and wrote a post about the formation of the new team. Over the weekend I caught up with Kristy from her Paris base via Skype to get an update on the team. I’ve been following the team’s progress via social media and their great website, and from my perspective they seem to be going well. It seems that Kristy is also very happy with the team and says they’ve surpassed all her expectations already, and it’s only June!! It all started late last year when the team got together for a launch training camp and the momentum has just kept rolling on. That’s pretty impressive for a team that rarely comes together except for races. Each of the team members has their own base and literally meets up just prior to each event. The team’s results speak for themselves. Australian Chloe Hosking kicked off the year with a win in The Herald Sun Tour on New Year’s Day. Her team mates have added to that tally many times over and in two recent races the team swept the podium – at Chrono Gatineau in May and the Exergy Tour time trial in Idaho in late May. Kristy also attributes the team’s success to the fact that it’s an Olympic year which has an effect on everyone who’d like to be selected. And speaking of Olympic selection, Kristy is hopeful that nine to ten of the women will make their respective Olympic cycling teams. The US team has already been announced and Specialized lululemon’s Evelyn Stevens and Amber Neben are key members of the squad. And while the Olympics is important to them, they are already planning beyond London to some key races including a team trial that’s a warm up event for the World Championships in Holland in September. It’s the first time a team time trial has been run just before the World Championships that allows the professional teams like Specialized lululemon to race together and then head straight into the World Championships with their national teams. 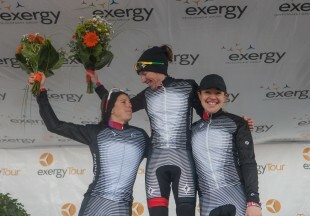 Kristy is pretty chuffed that so many people want to buy the team’s kit. I know from the keyword searches for this blog that lots of people are looking to buy the Specialized lululemon kit and I’m pleased to say that you can buy it through lululemon although I’m not sure what stores carry it in Australia. Kristy tells me that it sold out in the first 24 hours when it went on sale on the north American lululemon website. I plan to buy one myself later this year when the weather warms up. The interest in the team continues to grow and it’s no coincidence that the team members are excited about the future and keen to inspire other women to take up cycling. They are focused around a common goal to win races but also find time to be involved in charities like ‘Right to Play’. As for Kristy she’s happy if the sponsors are happy and they’ve all indicated that they’d like to continue their involvement which is fantastic for the team’s future. If you think I’m being a bit biased and only talking about one team, you’d only be partially right. Yes, I think it’s a great team and is definitely my favourite. However, I was keen to write about the Greenedge women’s team but I’ve been unable to make contact with them. I’ve sent numerous emails to the team and contacted a few others who may have better access than me to no avail. I’ve also tried utilising their website to compile my own story and I have to say that the Greenedge Cycling website is difficult to navigate and basically I gave up. If someone from the team wants to contact me I’d love to write about them.